The focus of this research is in the definition of programmable expert Personal Health Systems (PHS) to monitor patients affected by chronic diseases using agent oriented programming and mobile computing to represent the interactions happening amongst the components of the system. The paper also discusses issues of knowledge representation within the medical domain when dealing with temporal patterns concerning the physiological values of the patient. In the presented agent based PHS the doctors can personalize for each patient monitoring rules that can be defined in a graphical way. Furthermore, to achieve better scalability, the computations for monitoring the patients are distributed among their devices rather than being performed in a centralized server. The system is evaluated using data of 21 diabetic patients to detect temporal patterns according to a set of monitoring rules defined. The system’s scalability is evaluated by comparing it with a centralized approach. The evaluation concerning the detection of temporal patterns highlights the system’s ability to monitor chronic patients affected by diabetes. Regarding the scalability, the results show the fact that an approach exploiting the use of mobile computing is more scalable than a centralized approach. Therefore, more likely to satisfy the needs of next generation PHSs. PHSs are becoming an adopted technology to deal with the surge of patients affected by chronic illnesses. This paper discusses architectural choices to make an agent based PHS more scalable by using a distributed mobile computing approach. It also discusses how to model the medical knowledge in the PHS in such a way that it is modifiable at run time. The evaluation highlights the necessity of distributing the reasoning to the mobile part of the system and that modifiable rules are able to deal with the change in lifestyle of the patients affected by chronic illnesses. 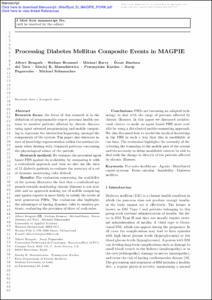 de la Torre, A.B., Bromuri, S., Barry, M., Jimenez, O., Mazurkiewicz, M., Kardas, P., Pegueroles, J., Schumacher, M. Processing Diabetes mellitus composite events in MAGPIE. "Journal of medical systems", 1 Febrer 2016, vol. 40.